My collaboration with Julie Blagojevich of Crochet works resulted in this fabulous crocheted shawl. This beautiful design is asymmetric, starting from one corner and increasing to end in an elegant lace edging. 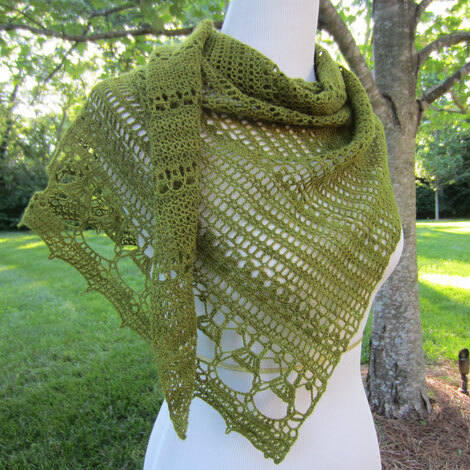 The pattern for Rowena can be purchased from Julie's Ravelry store. It is completed with a single skein of my softer than soft Falkland fine merino lace. The colourway shown is Greendale. 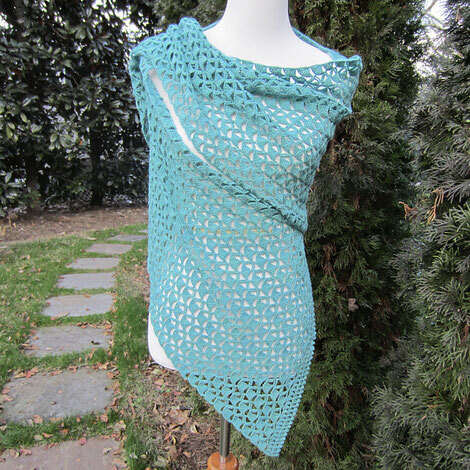 Ainsley is a lacy parallelogram-shaped wrap worked in an unusual stitch combination. It results in a crocheted fabric that is biased as well as light and airy. The simple, geometric edging complements the wrap’s body. You can find Ainsley in Julie's Ravelry store. Ainsley is crocheted in my Falkland Fine Merino laceweight yarn. The colourway shown is Meden.